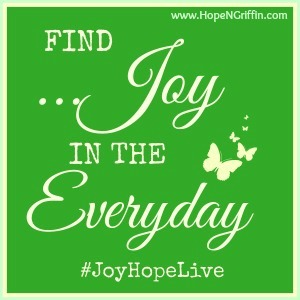 Hello Everyone & welcome to #JoyHopeLive Linkup! Can you believe it is almost September? I can’t believe summer is over already and I didn’t even get a chance to get ANY sun……wah! I did a little checking and found that the word Rejoice (or some variation) appears in the bible 268 times. Joy/Joyful is in the bible 160-220 times depending on the version of the bible. So, together that is over 400 times!! Seems to me that our feeling Joy in the ways of the Lord are very important to Him. Key phrase being, In The Ways Of The Lord. I hope everyone is having a great week. Please link up and share some midweek Joy with us. I look forward to reading each of your posts! By submitting a link to this party, you are giving Hope N. Griffin, My Life In Progress and Tapestry Chronicles permission to feature your post on their blogs and/or social media platforms and utilize your post images in order to facilitate this feature. Sign up for the weekly newsletter so you will receive a reminder of this linkup every Wednesday morning. The little things, like dog kisses, bring me lots of joy! This is my first time linking up =) Thank you for hosting! I’ve added you to my list of parties. Wonderful, Sarah! I look forward to reading your post!